The Elbphilharmonie is not an opera house. Nevertheless, the Grand Hall has been proven an excellent stage for the great singers of our time. 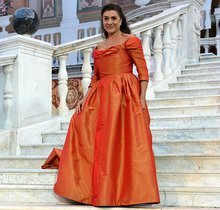 After their intense debut in the very first Elbphilharmonie season, the stellar tenor Jonas Kaufmann and the opera star Cecilia Bartoli, as well as others, return for the 2018/19 season with an evening recital of arias and songs. Please note that »Große Stimmen« will appear on subscription cards.